les batailles de Dorylaeum, Antioch, Ascalon, Harran, Montsigard, Arsuf. le second opus de la série Men of Iron consacré aux croisades. Fast playing . . . easily understandable rules . . . unusual battles . . . lots of action . . . lots of color . . . lots of cavalry … great leaders . . . lots of Fun.That’s what you get with GMT’s series on Warfare in the Middle Ages, Men of Iron. The system demonstrates why cavalry reigned supreme during the era of The Crusades with the second game in the series, Infidel. 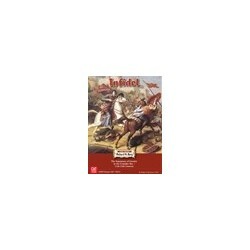 Infidel focuses on the major battles of the early Crusades era between the Christians and the Muslims. This is a period that saw cavalry reign supreme, and pitted the European heavy cavalry – armored “knights” - system against the Eastern/Turkish light cavalry tactics. Infidel is designed for quick learning and easy play. Game rules are short, there are no “turns” - play is Continual, with ample opportunities to steal play from your opponent - and combat resolution is a single dieroll.Playing time is about 1-2 hours, per battle. Infidel is also GMT’s gift to the gamer who enjoys playing solitaire. The system is designed for both individual and face-to-face play without any loss in insight or Fun. Each game is a "paper time machine" that allows players to see what happened in these famous battles and why. Dorylaeum (1097): The Crusader line of march, including the people’s Crusade and Peter the hermit, as well as all the great 1st Crusade Leaders, are “ambushed” by Kilij Arslan and his crack Seljuk cavalry. Antioch (1098): The exhausted, starving and depleted Crusaders – they had few horses left – have just taken Antioch and are now faced with a large Turkish army, under Kerbogha, sent to retake the city. Ascalon (1099): The Crusaders, having seized Jerusalem, turn south to fend off the suddenly active large army of The Fatimids, with their crack Mamluk heavy cavalry. Harran (1104): Baldwin II of Edessa seeks to maintain control of his little kingdom in northern Syria, something Soqman, atabeg of Damascus, is not happy to allow. One of the first major Crusader defeats. Montgisard (1177): Saladin attempts to destroy a small army from the Kingdom of Jerusalem with an army more than five times its size. Though there are only 400 knights, the Crusaders are led by the remarkable Baldwin IV, The Leper King. The outcome - one of the greatest Crusader victories. See if you can carry off this stunning upset! Arsuf (1191):The classic battle between Richard I Lionheart and the Ayyubid Army of Saladin highlighting the major facets of each army in an unusual moving battle.